Baantraject (Job journey) paves the path for people who really like to find the one open spot in the jungle of business. That place from which they can find their way quietly through the jungle. Baantraject carves a path, a train track. For the employer show them the way in the jungle of rules, convince them of the real qualities that long-term unemployed have. The benefit of people who are motivated because they have been sitting too long at home, who feel rejected and now a chance to get on track. 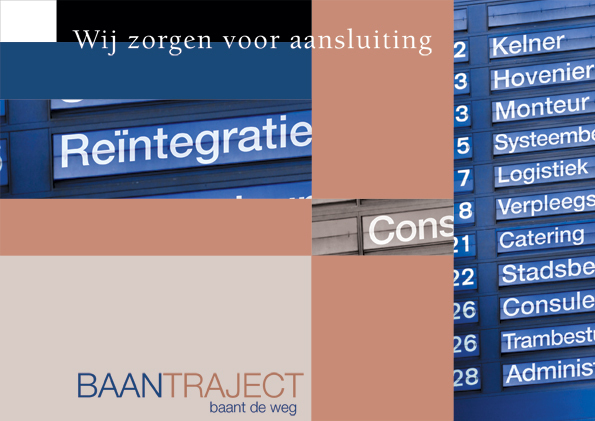 Baantraject gets blockages, helps people get back on track or in other words on the right track when they temporarily sidetracked or are there some forgotten waiting to be picked up. Because Baantraject knows how to operate the switches.